On February 26th at 7 p.m. 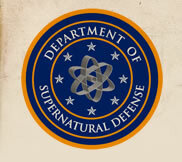 The United States Department of Supernatural Defense (DOSD) recruits, trains, arms, and deploys specially trained forces based within the nation’s borders in support of national security and defense strategies. To accomplish this, they provide relevant and ready support to commanders whose mission is to keep the country free of supernatural enemies, whether their origins are domestic, international, or otherworldly. •	COMMUNICATION: To maintain clear channels of communication, recognize specific areas of expertise, establish parameters for responsibility, and strictly obey authority. Since the nation’s enemies specialize in tactics of misinformation, misdirection, and stealth, it is essential that subordinates, peers, and superiors observe strictly defined procedures, and follow the lines of command without question or deviation. •	TECHNOLOGY: To employ individuals across a broad spectrum of expertise both scientific and paranormal, with the explicit goal of remaining on the forefront of weapons development at 10/20 standards. In extraordinary cases, where the weapons are beyond the limits of what one individual or organization may wield, and the use of those weapons would result in unfathomable catastrophe, such weapons will be kept beyond the reach of all individuals, friend or foe. •	READINESS: Provide combat ready, highly adaptive command individuals and fully manned units, trained and armed, prepared to execute their assigned missions. To train and manage the forces necessary to achieve stabilization, modularity, and rapid response. To develop leaders by choosing those soldiers who have proven themselves in the course of active duty, and further prepare them via a unique and rigorous officer training program. •	SECRECY: To maintain, without fail, an utter dedication to secrecy in the execution of the primary mission. To ensure that no member of the public has reason to suspect the existence of the supernatural threats that exist in the shadows, and to prevent at all cost any individual, nation, cabal, or organization from undermining the security and well-being of the American public.